Last year I did a talk at Hellens Garden Festival and I've been asked back to do a talk again this year. The last talk was on our journey with self sufficiency, one that wrote itself really, but this years is a little different, it's going to be about gardening with children. My talk will be at 2 o'clock on the Sunday so I hope if you're local you'll come along and give me a bit of support! The whole day is for a great cause and there's loads going on for children and adults. the day we had there last year was amazing. This is certainly a subject I think I have a lot of experience with, as during the last five years I've really tried to involve my children in everything I do here when it comes to growing our own food. 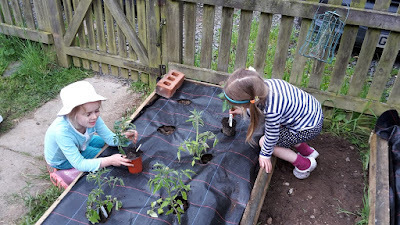 I've got lots of tips and tricks for getting them to help out, as well as having them with me whilst I grow most of the veg we eat, from things I've made to getting them to dig for things like New Zealand Yams and pretending it's buried treasure! But I want to know what your top tips are for getting children to help you in the garden? I always tried to grow things, with the children, that grew quite quickly. 18 day Radishes, Calabrese, Courgettes, etc. If they could see the results within one school term they were happy. If I was local to your area, I would definitely go to the festival - looks a really good event on so many levels. The promise of strawberries always gets our grandsons in the garden. But like your children, they love to be outside with me, with their gardening gloves on getting in the dirt. kev - you are awesome sauce! you, and my friend Ed from Riverbend Journal, are 2 of the best dads on the net!